Check in after 1.00 p.m. and check out before 12.00 a.m. Check out late cause 100 Baht per Hour. Room rates are inclusive all VAT and government tax, swimming pool and Wifi internet free and are applicable for either single/double stay, but room rate are exclude breakfast but can buy at lobby at 120 Baht per ABF per person. Extra Bed for Third person (except for child under 8 years) prices 400 Baht per night for all rooms type except Superior type (extra bed are not applicable for Superior room type). Joiner need to register before enter by submit ID card for register to the reception for security otherwise guest will be extra charged 500 Thai Baht. 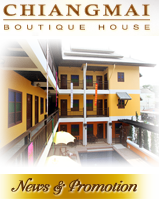 Chiangmai Boutique House may refuse to accept to accommodate the joiner if not comply to the rule. In case no register of joiner, guest need to take full respondsibility for all lost both private and hotel's properties. Cancellation of guaranteed booking must be made at least 72 hours in advance prior to the date of arrival. No-show or cancellation less than 24 hours will be charged 1 night at agreed rate. All advance deposit made need confirmation of room availability from Chiangmai Boutique House by email, phone or fax, in case if no room availablity, we'll refund you back within 48 hours. Credit Card VISA, Mastercard are accept with 2.5% additional. All room types are non-smoking room.